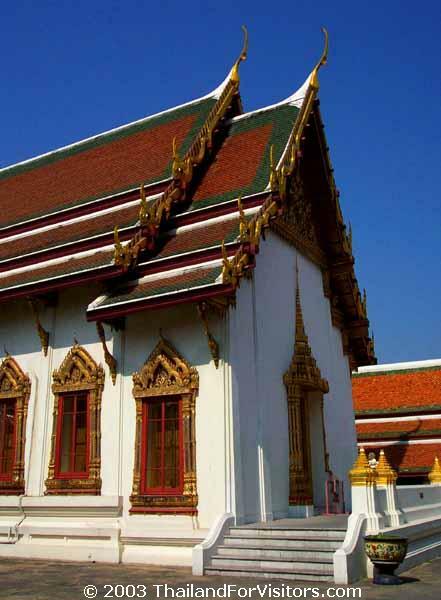 The original Ho Phra Nak was built by Rama I a few years after the rest of the temple was constructed. It was built to house the Phra Nak Buddha image that had been rescued from Ayutthaya. 'Nak' is the Thai word for an alloy of gold, silver and copper. King Rama III had the original building demolished and built the current structure in its place. Even though the building still carries the name 'Ho Phra Nak' the Buddha image itself was moved to the neighboring Wiharn Yod. The Ho Phra Nak is now used to house the ashes of minor royals.